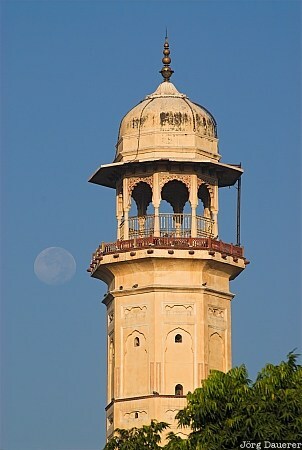 The full moon sets behind the Iswari Minar Swarga Sal Minaret as it is illuminated by the first light of the day in downtown Jaipur. I used a long tele lens to make the moon appear bigger. Iswari Minar Swarga Sal is also known as Heaven Piercing Minaret. Jaipur is the capital of Rajasthan in northern India. This photo was taken in the morning of a sunny day in October of 2007. This photo is part of the exhibition Towers (February 2011). This photo was the image of the month in May of 2010. This photo was taken with a digital camera.